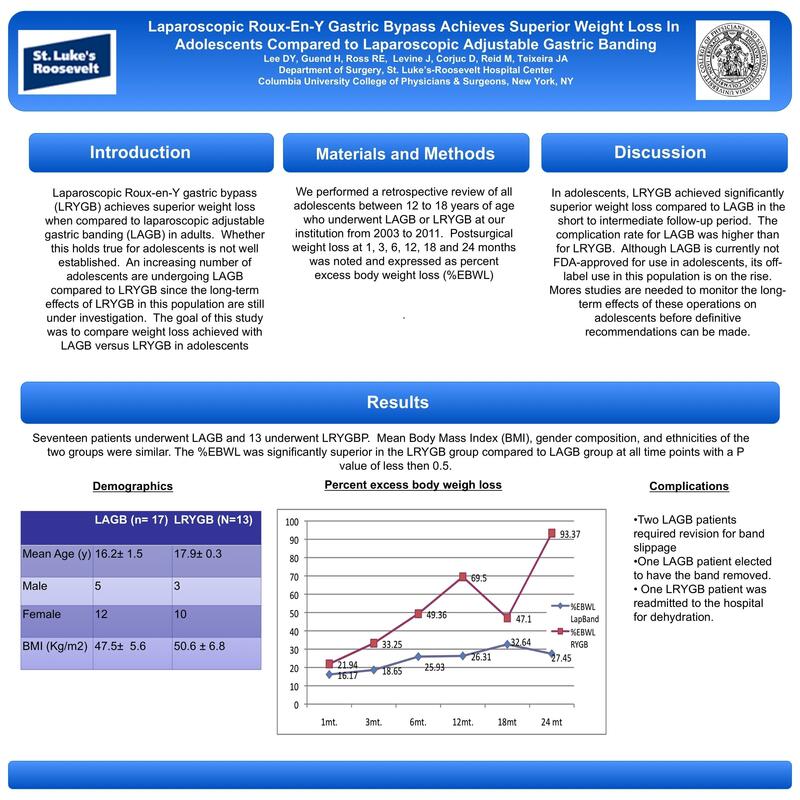 Laparoscopic Roux-en-Y gastric bypass (LRYGB) achieves superior weight loss compared to laparoscopic adjustable gastric banding (LAGB) in adults. Whether this holds true for adolescents is not well established. An increasing number of adolescents are undergoing LAGB compared to LRYGB since the long-term effects of LRYGB on this population is still under investigation. The goal of this study was to compare weight loss achieved with LAGB versus LRYGB in adolescents. We performed a retrospective review of all adolescents between 12 to 18 years of age who underwent LAGB or LRYGB at our institution from 2003 to 2011. Postsurgical weight loss at 1, 3, 6, 12, 18 and 24 months was noted and expressed as percent excess body weight loss (%EBWL). Seventeen patients underwent LAGB and 13 underwent LRYGBP. Mean Body Mass Index (BMI), gender composition, and ethnicities of the two groups were similar. The %EBWL was significantly superior in the LRYGB group compared to LAGB group at all time points (Table 1). Two patients who underwent LAGB required revision of band for slippage and one patient elected to have the band removed. One patient who underwent LRYGB was readmitted to the hospital for dehydration. In adolescents, LRYGB achieved significantly superior weight loss compared to LAGB in the short to intermediate follow-up period. The complication rate for LAGB was higher than for LRYGB. Although LAGB is currently not FDA-approved for use in adolescents, its off-label use in this population is on the rise. Mores studies are needed to monitor the long-term effects of these operations on adolescents before definitive recommendations can be made.